We had a great month onboard Absolute Ocean Charters’ flagship vessel the ‘Contessa C’, on our Broome fishing charters this September. This time of the year can be awesome fishing for anglers of all skill levels. The Blue Line Emperor, (or Black Snapper as we like to call them) school up on the reefs between 20 and 30m and are very aggressive on baits. It’s not uncommon to land a dozen of these hard fighting, great eating fish within a few minutes. Sometimes it’s a struggle to get away from them to try and catch a different variety and usually everyone gets a great feed to take home. 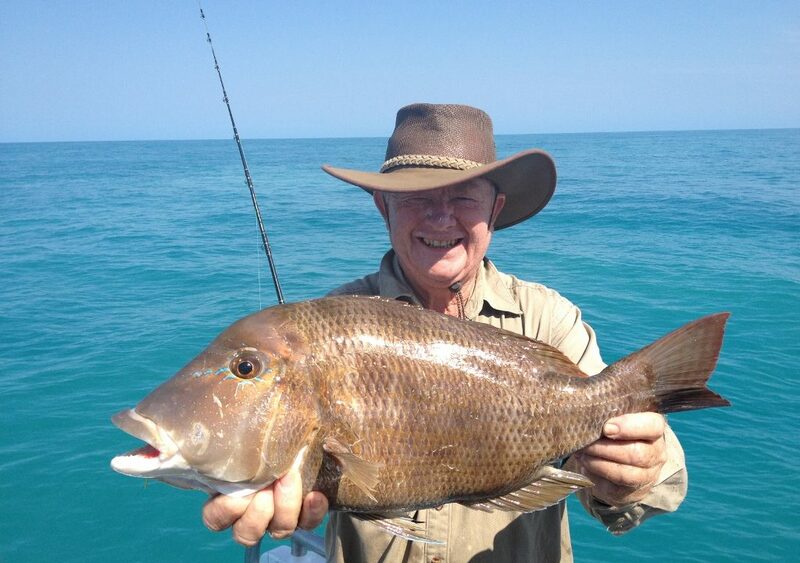 No one on our Broome fishing charters ever complain about catching too many Black Snapper though. Spanish Mackerel have been a little patchy and we have found that if they are caught one day in an area, there is not guarantee that they will be back there the next day. When they are on, we have had some good catches of up to 12 Macks in a session on our Broome fishing charters. We have gone off using the trusted Yo-Zuri lures due to a price increase. At almost $40 a pop it makes me cry every time a shark smashes a Mackerel and takes off with a prized lure. We have tried and tested a new brand now, and for half the price we are finding they swim well straight out of the box and are still swimming true after 10 or 12 fish. I actually overheard a customer making comments to one of our crew about how old a lure looked; he stated “we wont catch a fish on that thing, it must be years old!!”. His jaw almost hit the deck when the crew member told him he rigged it yesterday and that’s what they look like after catching a dozen Mackerel. We did get the Contessa C out and fish a bit deeper on a couple of our Broome fishing charters over the September period but found the red fish to be a bit hit and miss. 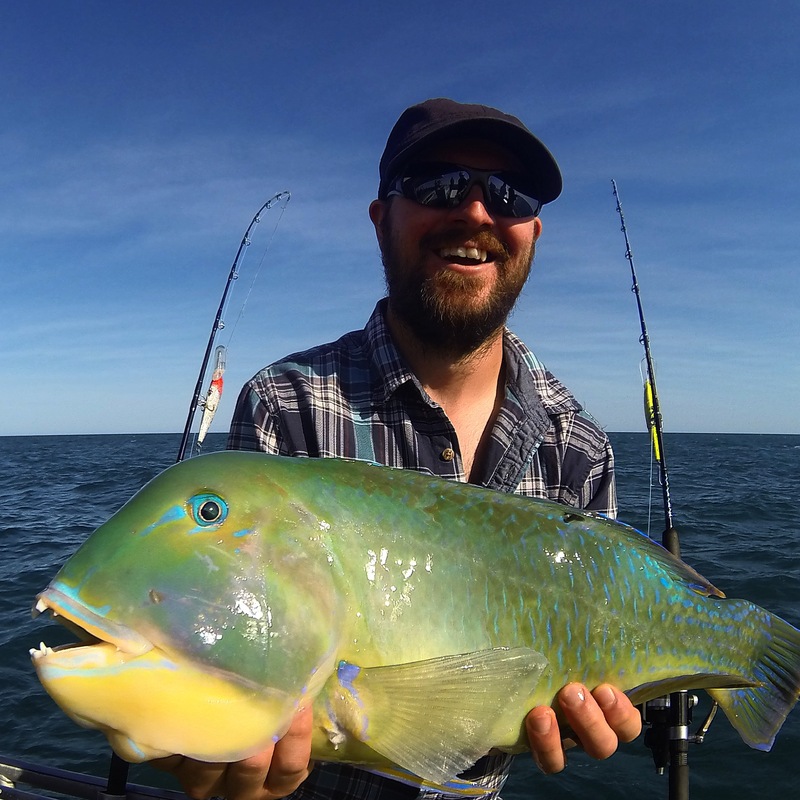 When we persisted we were rewarded with a few nice Red Emperor, Saddletail Perch and Rankin Cod but we definitely found it easier fishing in the 20 to 30m on the Black Snapper grounds. One night right back at the beginning of September we had a keen group of anglers out for a night fish. We actually struggled to find a fish for the first few hours of the charter so I decided to try a tactic we don’t use too often. There is a small ridge we fish to the North of Broome on our fishing charters and pickup the occasional Black Jewfish when fishing day light hours. We had perfect conditions to anchor up on this little patch and we were rewarded with an awesome catch including 9 Black Jewfish to 1.4m, a nice Red Emperor, Estuary Cod and a massive Black Snapper. All within the space of 30mins we turned a below par charter into a cracker. Persistence always pays off and it definitely doesn’t hurt to get outside the square.